These conditions have not changed. For the hardships for this country have not yet begun, so far as the supply and demand for foods are concerned. This reading was specific to the then on-going WWII situation, although in December of 1943 America was just beginning to come out of the war. Home Front Victory Gardens were common, and we all had books of food-ration stamps for grocery shopping. It is interesting how some predictive readings may not only pertain to the immediate times in which they were given, but also to times much later as well. For example, the U. S. food-supply situation did not get any worse after the reading was given (December, 1943), and America has had no hardships since then, "so far as the supply and demand for foods are concerned." The word "supply" in the above reading may refer as much to an inability to produce enough food as it does to an inability to harvest, process, and distribute that food. Cayce reading 2746-2 (1943) refers to a time when "turmoils are to arise" in America and says that Norfolk, Virginia, will be a safe place. In the reading, the turmoils sound like they will be produced by Earth Changes, but one could interpret them also as being due to the impacts of social strife, or even terrorism. In any event, for much of America obtaining enough food might be a problem of some duration. Anyone who can buy a farm is fortunate; and buy it if you want to grow something and don't want to grow hungry in some days to come. Regarding modest stockpiling of food, here is an extract from reading 1947-8, given for a 34-year-old woman on December 16, 1941, just nine days after Japan attacked the U. S. at Pearl Harbor. Q) For future health protection for my family, should water and food be stored for emergency? To last how long a period? Any further suggestions? A) No. It should be remembered that the food, the silver, the gold is the Lord's. To be sure, consistency should be used in taking into consideration the exterior problems; but such considerations as these are not problems in the present. This reading proved to be correct. In retrospect, it was not necessary to store food and water, even as the nation plunged into WWII. But today, as pole shift and Earth changes loom, we might conclude that "such considerations" are indeed relevant and that we should prepare for a potential breakdown in the food-supply system. How to do this? A prudent approach would consist of developing at least a one-month stockpile of food. Although no one knows exactly what to expect, a six-month supply might be better because a shift in the poles might begin in mid-winter in the northern hemisphere. Suburban and rural dwellers will be at an advantage for stockpiling food and storing water. Inner-city residents may have difficulty and may need to rent storage space in mini-warehouses. It might also be wise to save three month's worth of expenses in the form of coins and bills (20-dollar bills and smaller). These probably shouldn't be kept in a safe-deposit box in a bank because the banks may be closed if there is a panic. Those who can store six to twelve months worth of food and put away a year's worth of expenses as cash will be quite fortunate. The very fortunate will be those who will be living on a paid-off farm, in a geologically safe area. Just What Are The Threats To Our Food Supply Going Forward? It seems best to consider a confluence of factors that might work to affect the supply and demand for foods in the near future. We will look at these one by one, starting with those that might impact food delivery. Let's consider problems that might arise with food delivery. Remember the fearful days of the Y2K computer bug? Well, we might want to consider once again what could happen if the internet or other vital computer networks were to go down, for any of a variety of reasons given later. At this point I am going to quote, with light editing and with the addition of a few of my ideas, the analysis provided by the E. and J. Yourden in their classic book Time Bomb 2000 (Prentice Hall). The following is from one of the free, prepublication on-line chapters of their book. Our primary concern involves deliveries, both to the neighborhood grocery store, and to the fast-food outlets that some citizens have come to depend upon. Fresh food, by its very nature, has to be replenished and re-stocked on a frequent basis. Many other forms of food (including the hamburger patties at your favorite junk-food emporium) are frozen, and thus could presumably be stockpiled to provide ongoing supplies of food for months or years. But both the hamburger outlets and the grocery stores operate on razor-thin profit margins, which require keeping low inventories and using a "just-in-time" delivery mechanism to restock on a daily or weekly basis. While you might not be able to determine the inventory levels at your local MacDonald's or Burger King, you can certainly investigate the situation at your grocery store. Chances are you'll observe daily restocking in many departments, especially in the fruit-and-vegetable area, as well as meat and dairy products. Most of the non-perishable items, including those packaged securely in cans, boxes, or plastic containers, are re-stocked once or twice a week. Next, take a look at the inventory levels. As part of your normal shopping, you may have occasionally encountered the out-of-stock phenomenon, but it's fairly rare in American stores. It's far more common that you'll take one loaf of bread off a shelf filled with what might seem, to the casual observer, an infinite quantity of loaves. But it's more likely to be a few dozen loaves, or perhaps a hundred at most. The same is true for most of the other items in the store; most of the store's inventory is right in front of you, on the shelves. Now ask yourself a simple question: what happens if you and a few dozen of your neighbors all decide to buy a loaf of bread on the same day? And what if you decided to buy a month's supply of cereal, instead of a one-week supply? The answer is pretty simple: the shelves would be bare, except for items like pickled kumquats and marinated pig's feet. However, in today's economy, it doesn't matter, because the shelves will be restocked tomorrow. And because everyone takes it for granted that that will be so, there's no need to get a month's supply of cereal; it's more convenient to buy enough to last for just a few days. So, the bottom line is that precise inventory management, and a well-honed delivery infrastructure, are crucial for maintaining the well-stocked grocery store we take for granted. The same, by the way, is basically true for the fast-food outlets: most of them operate as franchises, and are obliged to replenish their supplies from the franchise-owner. This allows the franchise-owner to achieve economies of scale (by purchasing millions of pounds of beef at a time), and also allows the franchise-owner to maintain control over the proprietary nature of the junk food (e.g., the secret formula for Kentucky Fried Chicken, invented long ago by the fabled Colonel Sanders). Each franchise keeps careful track of the quantities of food sold, not only to maintain a reasonable reputation of providing hot, fresh junk food, but also to optimize the steady process of re-stocking by the franchise-owner. A loss-of computer-networks (LOCN) problem can easily disrupt the delivery and inventory-management process. Inventory management is still done without computers in some establishments - you may have noticed grocery clerks manually counting the number of boxes of cereal on the shelves - but more commonly today, it's computerized. The same grocery clerk is involved, but now he carries a hand-held scanner that reads bar-code labels; sometimes the clerk keys in a few entries to indicate the quantity of goods left on the shelf. In theory, this should not even be necessary, because the cash registers at the checkout counter are connected to a central computer, too, so that inventory-management reports can be printed out in the store-manager's office. However, the manual process is still important to keep track of spoilage, breakage, theft, and other forms of loss that might not be detected at the checkout counter. Keeping track of how many boxes of cereal were sold, or how many Big Macs were consumed, is only the beginning of the inventory management process; what happens next is a forecasting computation to determine the likely number of days before the existing inventory will be completely exhausted, and whether the reorder-quantity should be larger or smaller than usual to account for fluctuating trends and patterns. Indeed, this process has become enormously more sophisticated in recent years, with massive computer computations involving something known as "data mining" to look for trends that might not have been obvious to the human eye. So there's a lot of computer intelligence behind the scenes, and - as you might have guessed - it's also sensitive to a LOCN. Indeed, dates and date-calculations are essential to the whole process of inventory management. Thus, we worry that inventory management systems, delivery-scheduling systems, data-mining systems, and much of the "intelligence" that ensures the proper stockpiling of the proper items at the proper time may blow up if a LOCN occurs due to a giant solar flare, an electromagnetic pulse from a high-altitude nuclear explosion, or a terrorist act that destroys the electric grid or the servers that keep the internet running. Thus, one could expect a moderate amount of chaos and confusion while all of this is being sorted out during the first few days, weeks, or months after a LOCN. But this may not turn out to be the biggest problem. Assuming that the inventory-control computer systems are working, there is still the issue of transporting food items from the farm, the fishery, the bakery, or the slaughterhouse to the store. This requires a vast, intricate network of ships, planes, trains, and trucks - all synchronized to deliver the right amount of food items while they're still fresh. At this point, transportation problems could quickly "ripple" into food-delivery problems. This is likely to be much more of a problem for urban centers than for suburban and rural areas for a simple reason: the rural areas are closer to food-producing areas, and are thus not as dependent on trucks, trains, and planes. Urban centers, on the other hand, may face a serious problem. Consider New York City. While there might be the odd back-yard garden in Brooklyn or Staten Island, Manhattan is basically sidewalks and streets - unless one wishes to contemplate converting Central Park into a gigantic garden plot. Manhattan is an island, which means that no food will arrive unless transported by boat, plane, truck, or train from other parts of the country - and because a population of 8 million people enjoy eating as a daily activity, large quantities of food have to be delivered on a daily basis. Some portion of this food is delivered by large companies (e.g., major dairy companies, or large companies like Dole and Heinz, etc.) to chains of stores throughout an urban region. Once the inventory-control problems and generic transportation problems have been worked out, we would expect these deliveries to resume in the normal fashion. But there are also numerous food-suppliers who deliver their goods to small, independent merchants - e.g., the local delis that populate nearly every street corner in Manhattan. And even in the case of the large companies, the deliveries are often made by independent truckers; this latter category is especially important, for even if food is brought to the edge of Manhattan by boat or plane, the final portion of the delivery is almost always made by truck, directly to the store or merchant. Now consider the following scenario: you're an independent trucker, based in New Jersey or Connecticut or Long Island; you spend your days filling your truck with rutabagas and onions at the railroad depot in Newark, and you deliver the fresh vegetables to a dozen small stores and delis in Manhattan. It's now January and you've been having a heck of a time finding gas for your truck and figuring out how to avoid all of the delays at the bridges and tunnels that lead into Manhattan. Not only that, the onions and rutabagas that were supposed to arrive in Newark last week were delayed by a snafu in the train system. But all of that has now been overcome, and you're ready to make your delivery, as long as one thing can be assured: upon delivery, you'll be paid. Well, one other thing would be nice, too: having been paid, you'll be able to drive back to your modest home in New Jersey without being shot, hijacked, or robbed. Indeed, the very prospect of payment problems and crime problems will be enough to keep some of the small, independent truckers from making such deliveries. And this creates a ripple effect of its own: the residents of Manhattan want to eat regularly, just like the residents of Brooklyn, Queens, Staten Island, and the Bronx. Not only have the food deliveries diminished sharply, but the welfare checks and food coupons, which some members of the city rely on, have gotten fouled up in the computers in Washington. Oil deliveries have been delayed because of some other snafu, and with an early-January temperature hovering near zero, the heat has been turned off. This combination of events would be enough to put anyone - including the well-heeled residents of Park Avenue on the Upper East Side, as well as the less-affluent citizens in other parts of the city - into a foul mood. So, yes, perhaps there will be a few more shootings, hijackings, and robberies than normal. The interesting question is whether the legitimate concerns of the independent truckers might keep them from making deliveries anywhere in Manhattan, not just the neighborhoods they might normally associated with higher levels of crime. And if a problem like this exists in Manhattan, one could make a good argument that it will also occur in Boston (beginning with Roxbury), Chicago (beginning with the South Side), and a dozen other cities. Even without the issue of crime, the smaller cities may have a problem -- for they will be served, more often, by smaller trucking firms who will insist on cash, gold coins, wampum, or some other credible form of payment before they unload their trucks. Planning for a two-day disruption should be relatively easy; it simply requires stockpiling a couple days of food in the house. Keep in mind, though, that the food-related LOCN problems could occur at time. Thus, it would be a good idea to ensure that, at all times, you've got a modest stockpile that could provide breakfast, lunch, and dinner if the stores shut down for a couple of days. As we've noted, residents of weather-sensitive areas of the country are quite familiar with this strategy. When they first hear of an impending hurricane or blizzard, many families drive to the local super-market to stock up on milk, bread, bottled water, and various other essentials; then they can ride out the storm without any major inconvenience. It's the city dwellers who will need to begin practicing this kind of stockpiling. There's not likely to be a problem of cost; except for the people at the bottom of the socio-economic ladder in the U.S., virtually everyone can afford to buy a few days' worth of food in advance. The biggest problem for the city dwellers will be laziness or procrastination. Obviously, a one-month disruption in the food supply is far more serious than having to coast on leftovers and peanut-butter sandwiches for a couple of days. Stockpiling a month's food is potentially expensive, and it's also inconvenient; since most Americans have never had the experience of being cut off from their food supply for a month, it will be difficult to convince them to plan for the eventuality. Again, suburban and rural dwellers are at an advantage here, for they're more likely to have a freezer, a cool cellar, and various other storage sites in which they can stockpile food. Those who are near hunting and fishing areas, and those with a backyard garden plot, may already be in the habit of canning or freezing a supply of food -- not for disaster prevention, but simply to take advantage of the fresh food or meat when it's available. The city dweller, crammed into a small apartment, barely has enough room in the refrigerator for a two-day supply of food; the notion of a freezer for additional food supplies is out of the question. In this scenario, you probably won't have an opportunity to install a freezer; almost all of the mini-warehouses are unheated, empty spaces, with no electrical outlets or running water. Thus, you'll need to stockpile food that requires no refrigeration, but can also withstand cold (and possibly even freezing) temperatures. You won't stockpile a month's supply of fresh milk, but you might stockpile powdered milk, along with a supply of canned or freeze-dried foods. You may have sworn that you would never again eat the canned peas that you had to tolerate as a child; but canned vegetables do have the virtue of remaining edible for reasonable periods of time. It's not really difficult to organize this level of stockpiling; it may require as much as a few hundred dollars, depending on your taste for food. It may require a commitment for the rental of a mini-warehouse. It will certainly require a few hours of effort to think carefully about the combination of food that you and your family will find nutritional and at least minimally pleasant to eat. It may require several hours, and multiple shopping trips, to accumulate the supplies and store them away. But anyone who is serious -- with the exception of those at the poverty level -- can do it. Here's what one can do: stock up on canned and dried foods that do not need cooking and require a minimum amount of water to prepare. (Stock up on water, too, of course). Pinto beans, for example, would not be a good choice because they require lots of water to clean, soak and cook and at least an hour of cooking time. But canned tuna would be good, as well as the sun-dried fruits and nuts that are available in health food and specialty stores in the fall and winter. A nationwide chain that specializes in dried fruits, nuts, trail mix, etc. is Trader Joe's. Also, stores that specialize in recreation have prepackaged freeze-dried meals that need only a small amount of boiling water to prepare. This type of food is used by backpackers and mountaineers, who have to trek all of their food and cooking supplies into the wilderness and then trek them out, so it takes minimal space and is easy to prepare, while being high energy. A nationwide chain that specializes in this type of food is Recreational Equipment, Inc. For people who live in urban areas, there are ways you can grow small amounts of fresh fruits and veggies year-round indoors, or in window boxes or atriums (if you live in the Western or Southern states). Many apartment dwellers already have "gardens" devoted to flowers. It would be quite simple to convert them to lettuce, onions, tomatoes, carrots, etc. You could also can or dry (by sun or with a food dehydrator) fruits and veggies from the summer harvest, no matter where you live. The biggest problem that we see in this area is psychological: stockpiling a month's supply of food forces you to acknowledge that you are serious about LOCN planning. Your family may disagree with you, and if you tell your friends and business colleagues, they may laugh at you. "What are you, some kind of end-of-the-world, gloom-and-doom nut?" they'll ask. No one wants to be branded a lunatic, and this level of stockpiling is likely to be the dividing line between normal caution and lunacy, in the eyes of your friends and family. Ultimately, the decision here is a personal one, or one that is made by consensus within your family. Remember that a one-month supply of food is the best form of insurance: you can eat it if you don't need it. Indeed, that should be one of the major criteria for choosing emergency food in the first place: if it's so awful that you'll throw it away when the LOCN emergency passes (or if it fails to materialize), then you shouldn't buy it in the first place. If a one-month stockpiling effort is difficult, then the notion of a one-year food stockpile is likely to be entirely beyond the ability of most. Indeed, most Americans would have no idea how to go about such a task; it's not something we were taught in school, nor have we ever seen anyone do it. Does it make sense at all? Can anyone imagine the local food stores being closed for 365 consecutive days? If such a catastrophe were to occur, it would drastically change the landscape of most urban centers; there would be food riots in the street for some period of time, and then everyone would leave -- for while there might be a few ultra-conservatives with a one-year food supply, the overwhelming majority would have no such reserves. And assuming that the farms, fisheries, and ranches are still producing edible food (we haven't bothered exploring the possibility of LOCN problems so severe that this part of society breaks down, too), then sooner or later food will show up in the cities, for whoever happens to be left. The same would presumably be true for the small towns, suburban and rural areas; the primary difference is that the people in these areas would have been somewhat more self-sufficient in the interim. The point here is that we're not trying to suggest that a LOCN-induced food-distribution problem will completely eliminate the supply of food for a full, solid year. But there's also no guarantee that any confusion and chaos will magically end in just a year; indeed, if food-distribution problems are combined with transportation problems, electrical problems, and problems in the various other areas, it's not at all unreasonable to imagine recurrent, unpredictable problems with the food supply over a period of 3-5 years, each one lasting for a day, or a week, or a month. Thus, the notion of a one-year food stockpile would most likely be meaningful for those concerned about such long-term difficulties. Building a one-year food stockpile is something that will be difficult for most Americans to accomplish without professional assistance. Many of the items one would normally buy in a grocery store are simply not intended for long-term storage. Most food items are packaged in plastic, cellophane, boxes, or other containers that contain a certain amount of air; the air contains oxygen, and the oxygen contributes to a slow but steady spoilage of the food. There are some items in the store that are vacuum-packed (including junk-food snacks like Pringle's potato chips, for example) or freeze-dried (including many varieties of coffee), but this accounts for only a small part of the overall diet that a normal family would require. Family Food Storage Catalog, 255 East 400 South #150, Salt Lake City, Utah 84111, U.S.A., phone (801) 531-8996. Walton Feed, 135 North 10th, PO Box 307, Montpelier, ID 83254; phone (800) 269-8563. Most of the emergency-food suppliers assume that a one-year supply will include a substantial amount of corn, wheat, rice, and pinto beans; thus, it's likely that to use these supplies, you'll need to be willing to bake your own bread, as well as cooking meals that are probably much simpler than the meals you now enjoy. As noted above, planning for this kind of a LOCN contingency is not easy, particularly because it's likely to create scorn, ridicule, and merciless teasing on the part of your friends and neighbors. It's also more expensive -- a one-year food package for an individual adult is likely to cost $700-$1,000, depending on the supplier -- and it obviously takes much more storage than the two-day or one-month options listed above. But it can be done; the question is simply whether you feel the risk warrants such action. A ten-year disruption in the food supply only makes sense if you're willing to assume that almost all of the other problems areas discussed in our book have occurred in their most serious form. If the phone system, transportation system, governmental systems, electrical utilities, and all other aspects of our socio-economic system were to utterly collapse because of computer-network failures, then we would be reduced to an agricultural society reminiscent of America in the mid-19th century. There might be a few pockets of "advanced" civilization, but in this scenario, everyone else would be back on the farm. We're concerned, and occasionally pessimistic about the outcome of the LOCN problem, but not that pessimistic. However, it does occur to us, from time to time, that this scenario describes the current state of China fairly accurately. Wouldn't it be ironic if China escaped most of the LOCN problems because of its agrarian society, and the U.S. -- because of its extreme dependence on computers -- was reduced to the level of China's economy? For earthquake impacts on computer networks we ought to look first at the situation in California. Here are a couple of relevant readings. The Earth will be broken up in the western portion of America...The early portion will see a change in the physical aspect of the west coast of America. Q) Should California or Virginia Beach be considered at all, or where is the right place that God has already provided for me to live? A) Los Angeles, San Francisco, most all of these will be among those that will be destroyed before New York even.....Virginia Beach or the area is much safer as a definite place. Just how close might Californians be to the destruction of Los Angeles and San Francisco? Consider the following articles. LOS ANGELES (AP) - Southern California is overdue for the next ``Big One,'' say geologists who have uncovered a detailed history of more than a dozen major earthquakes in the past 1,500 years on a stretch of the San Andreas fault. Digging into layers of peat and debris that drape a section of the fault near Wrightwood, a small town in the mountains that divide the Los Angeles basin from the Mojave Desert, geologists dated 14 earthquakes that each measured an estimated magnitude of 7.5. Since 534, those quakes recurred every 105 years on average. The interval has been as short as 62 years and as long as 192. The last was in 1857 - 145 years ago. The chronology, the longest for any one fault in the United States and probably the world, is detailed in several studies appearing this month in a special issue of the Bulletin of the Seismological Society of America devoted to paleoseismology, or the study of ancient earthquakes, and to the 800-mile-long San Andreas fault. “As far back as we look, we see these earthquakes happening, so I'd say there's a very high probability of it happening again in the lifetimes of most people living in Southern California right now,'' said Tom Fumal, a research geologist with the U.S. Geological Survey and a co-author of several of the issue's 14 studies. “When I am stuck in traffic and I am listening to the news about homeland security and trying to prevent terrorist attacks, I am thinking, What about the 'terrorist' that is going to strike no matter what we do?'' said Lisa Grant, a University of California, Irvine, geologist and lead editor of the special issue. Based on recurrence models, there is about a 30 percent probability that a quake nearly as large as the magnitude-7.9 that rocked Alaska on November 3, 2002 will strike the southern San Andreas in the next 30 years. That number is in line with previous estimates. “Basically, the overarching significance to the general public is we are overdue,'' said Kerry Sieh, a California Institute of Technology geologist, a paleoseismic expert who was not connected with the latest research. Geologists cautioned that earthquakes, like the stock market, can defy prediction and don't necessarily strike at consistent intervals. Thus, a major, or even great earthquake in southern California could happen soon. The 200-mile-long rupture of the Earth's crust in Alaska's recent M 7.9 quake could be repeated along the San Andreas fault. The fault is primed for at least a magnitude 7.6 to 7.8 quake between San Bernardino and Palm Springs. (You will notice that the fault map on the above linked page shows the name of each fault, represented on the map by colored lines, on the status bar of your browser window. You can also click on any of the fault lines to get more information about that particular fault). As for the San Francisco area, we must look to the most important two faults there, the San Andreas and the Hayward faults. USGS scientist Jim Lienkaemper wrote recently about USGS research on large paleoearthquakes (that is, "fossil" earthquakes) of the southern Hayward fault in Fremont, Calif., over the past 500 years. The Hayward fault, a major branch of the San Andreas fault, lies under one of the most densely populated parts of California. USGSresearch indicates that large earthquakes of magnitude 6.8 to 7.0 occurred on this part of the fault four times over the past 500 years, with an average recurrence span of about 130 years, plus or minus 40 years, a shorter time span than previous studies had indicated. More investigations, said Lienkaemper, should discern if this shorter interval is characteristic of the fault or if an unusual cluster of quake activity caused it. The last of the four big earthquakes occurred in 1868. Thus, a major quake could occur on the Hayward fault at any time now. Earthquakes large enough to destroy San Francisco (1152-11) could devastate Silicon Valley (the San Jose area) as well. And many computer networks throughout California could be destroyed too. Refer to the shaking-intensity map for the Bay area compiled by the Association of Bay Area Governments (ABAG) for an M 7.3 earthquake on the Hayward fault. Now recall that reading 1152-11 speaks of disturbances in other parts of America, in addition to California. As to conditions in the geography of the world, or the country, changes here are gradually coming about. It is clear that if such changes begin to occur, there will be serious impacts to the infrastructure of the areas involved - including loss of the electrical power grid and loss of the all-important computer networks that underpin our food-production, storage, and distribution systems. Oregon and Washington states are also vulnerable to serious disturbances, as is probable for the St. Louis, MO and Memphis, TN areas, at least in terms of readings 3976-15 and 1152-11. As all subscribers to THC know, we are watching for the possible eruption of a super-eruptive volcano somewhere in Earth's torrid areas. This kind of an eruption can put enough ash into the atmosphere to “darken the Sun” globally. This was predicted to occur (in reading 3976-15) just prior to -- or during the beginning of -- pole shift. The resulting atmospheric darkening, and pole shift and associated Earth changes (breaking up of the Earth “in diverse places”), could result in severe climate changes and interruptions in the transport of foodstuffs worldwide. For a preview of the impacts that might occur as a result of climatic change, turn to our article on Krakatau. Finally, regional-scale volcanic activity could also affect food production and transport even if a LOCN could be “patched over.” Refer to our article on volcanoes in western America to watch. What is a drought? A drought is a period of abnormally dry weather that persists long enough to produce a serious hydrologic imbalance (for example crop damage, water supply shortage, etc.) The severity of the drought depends upon the degree of moisture deficiency, the duration and the size of the affected area. Meteorological - a measure of departure of precipitation from normal. Due to climatic differences what is considered a drought in one location may not be a drought in another location. Agricultural - refers to a situation when the amount of moisture in the soil no longer meets the needs of a particular crop. Hydrological (Water) - occurs when surface and subsurface water supplies are below normal. Socioeconomic- refers to the situation that occurs when physical water shortage begins to affect people. The impacts of a drought can be economic, social/psychological, outbreaks of human diseases, or environmental. Lack of rainfall for an extended period of time can bring farmers and major metropolitan areas to their knees. It does not take very long; a few rain-free weeks spreads panic and shrivels crops. We are told to stop washing our cars, cease watering the grass and take other water conservation steps. Continued sunshine without sufficient rain can turn a rain forest into a desert; so maybe sunny weather is not always the best weather. The Dust Bowl days of the 1930's affected 50,000,000 acres of land, rendering the farmers helpless. In the 1950's, the Great Plains suffered a severe water shortage when several years went by with rainfall well below normal. Crop yields failed and the water supply decreased significantly. California suffered a severe drought some years ago. Rainfall was below normal for 1 1/2 years, and by the time September, 1970, rolled around, the fire potential was extremely high and dangerous. Temperatures rose to near the century mark and fires began. Losses were in the tens of millions of dollars. The worst drought in 50 years affected at least 35 states during the long hot summer of 1988. In some areas the lack of rainfall dated back to 1984. In 1988, rainfall totals over the mid-west, Northern Plains and the Rockies were 50% to 85% below normal. Crops and livestock died and some areas became a desert. Forest fires began over the Northwest and by autumn, 4,100,000 acres had been destroyed. A government policy called "Let Burn" was instituted for Yellowstone National Park. The result? Half of the Park's 2,100,000 acres were incinerated. During the great drought of 1988, Governor Guy Hunt of Alabama led a statewide prayer for rain. It came the very next day, and thunderstorms continued for weeks (taken from the Newport, NC Homepage). NOAA has developed a satellite-based, very-high-resolution-radiometer surveillance system for measuring the health of worldwide vegetation. 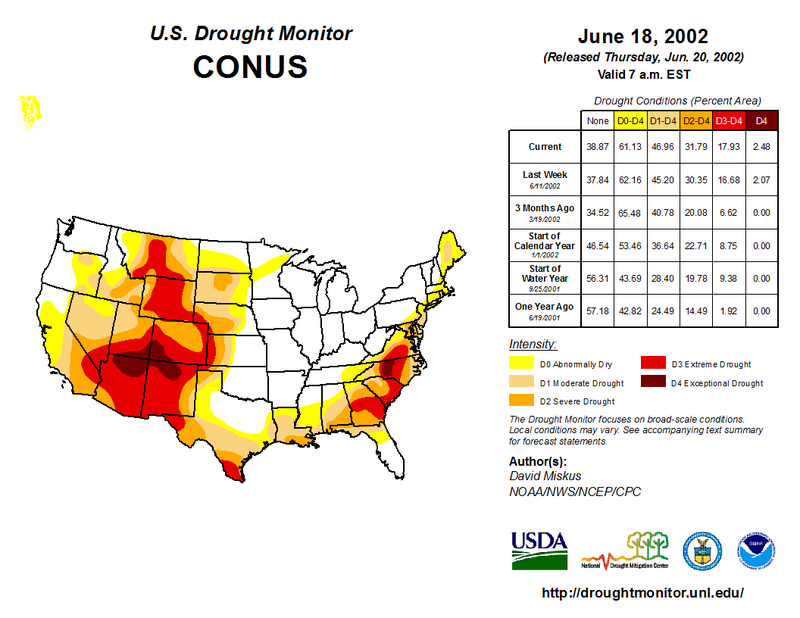 The system makes possible the estimation of areas under droughts of different severity, and it can be used to diagnose the potential for drought development prior to the actual start of drought conditions (EOS, 2002, v. 83, no. 48, Nov. 26). The report by NOAA's F. Kogan, in the issue of EOS just cited mentions well-documented links between some human diseases (malaria, dengue and yellow fever, cholera, etc.) and extreme weather events such as drought and heavy rains. For example, during the peak of drought development in 2000, numerous outbreaks of cholera and severe diarrhea cases were reported in Ethiopia. Analysis of the 2000 wheat yield indicated that in all countries where satellite data identified drought-related vegetation stress, yield losses were considerable. This NOAA satellite system is great tool for short-term drought forecasts. But the value of the system to humanity will fail completely should there be a global loss of computer networks. Drought forecast for the western USA - 2025 A.D. Here is the picture painted in a new study now being prepared by more than two-dozen engineers and scientists from the Scripps Institution of Oceanography, the U.S. Department of Energy, the University of Washington, and the U.S. Geological Survey. The year is 2025. The Salton Sea has long since died, the Sacramento Delta's water is becoming too saline to drink, the Colorado River has a fraction of its normal volume, hydroelectric plants can't function, and even desalination plants up and down the coast can't keep up with the demands of an exploding population. This sounds a little like Phylos's dreaded predictions of drought for America that we discussed in our May 3, 2002 article. In fact, the drought that has persisted for three years now is causing prices for grain storage packages to increase. "In the United States, Canada, Australia, Europe, and Argentina grain crops are expected to be the smallest in more than 30 years because of global drought conditions" (S. Portela, manager of Walton Feed, Inc.). Just where do we stand relative to the drought situation in America today? Here is the latest drought map for the U.S. Here we see the persistent nature of drought in many of the grain-producing states of the Midwest and High Plains. How does this play into the matter of the U.S.'s storage system of grain stockpiles that keep wheat, corn, oats and the like in sufficient quantities to tide us over from one harvest to the next? Look at the grain storage problems that might develop in America as a result of renewed drought in the breadbasket states, combined with a government-induced, declining, farmer-owned grain reserve. The following article published on line in November 2002, delineates the problem. Born on a modest farm in Ohio in 1914, Breimyer was a brilliant economist who began a long USDA career by driving country roads to sell New Deal farm programs in 1933. He retired as a nationally respected professor at the University of Missouri in 1984. Almost to his death in 2001, Breimyer wrote a clear, blunt newsletter called On The Economy. His newsletter recognized the stock market bubble early and predicted failure for the Freedom to Farm bill. This year is a taste of what's to come. If we have another drought as bad as the one of 1988 - when some Iowa counties had the least rainfall in recorded history - watch out. Prices could get so high that you'll [farmers] finally have something to put in the bank. Hang onto it. Breimyer's Depression-era contemporary, Agriculture Secretary Henry Wallace, got Congress to create his “ever-normal granary” in 1938. His idea of storing surplus crops for lean years came from Joseph's advice to the Egyptians in the Bible. We can assume that terrorism by physical destruction of the internet, or hacking of critical software, could cause a loss of many vital computer networks. Such loss could have a huge effect on the food supply and social stability. Bio-terrorism should also be considered. How could bio-terrorism possibly affect the food supply? Here's a snapshot. LAS VEGAS - They scarcely seem like the classic tools of terrorists: mooing cows, oinking pigs, and clucking chickens. But specialists in public health and agriculture warn that the nation's livestock and crops remain particularly vulnerable to terrorists, threatening the US agricultural system with viral and bacterial infections that could cripple the economy. Computer models show that an infection such as foot and mouth disease, which decimated Britain's beef industry in 2001, could sweep through 44 states within two weeks of its introduction at a handful of farms in a single state, resulting in 48 million livestock being put to premature deaths. Although many of the infections, including foot and mouth, pose no direct threat to human health, the economic consequences would be ruinous, specialists said at the Harvard-sponsored BioSecurity 2002 conference, and would seed considerable doubt about the safety of the nation's food supply. Foot and mouth virus ravaged agriculture as well as tourism in England, forcing quarantine measures against 10,000 farms and the destruction of 6 million cows, sheep, and pigs. Federal authorities consider the threat so significant that defense against agricultural bioterrorism has a special place in the newly created Department of Homeland Security. Also, last summer, in an exercise conducted at the behest of Defense Secretary Donald Rumsfeld, 40 veterinarians, emergency planners, and military authorities convened for a boardroom drill to assess the potential impact of bioterrorism targeted at farms and food processing sites. The exercise, dubbed Silent Prairie, assumed that the destruction could begin with something as common as a cotton swab dabbed with viral particles. The dean of the Harvard School of Public Health is so troubled by those threats that he called for the creation of an agency akin to the US Centers for Disease Control to monitor the welfare of the nation's crops and plants. Barry R. Bloom, the Harvard dean who served on a panel evaluating the threat of bioterrorism, told hundreds of public health, military, and private security authorities at the conference that the United States is woefully lacking in its ability to swiftly identify contaminants being introduced into livestock and plants. That remains the case even though the potential for terrorists to cause illness and fear by infecting the food supply became dramatically evident 18 years ago, when members of a fringe religious cult spiked salad bars at 10 Oregon restaurants with salmonella. The result: 750 people became ill. The damage that could be wrought by a more widespread attack, initiated at multiple sites, is profound, Bloom and other specialists said. Agriculture generates $1 trillion in economic impact annually, accounting for 13 percent of the gross domestic product. Farming is an exceptionally porous industry from a security standpoint, with 24,000 livestock ferried out of just one state, North Carolina, every day, destined for markets across the world. If terrorists chose a virus such as foot and mouth disease, it would spread with stunning efficiency. Studies have shown that the virus can be carried by the wind up to 40 miles; once introduced to a herd, it is 100 percent infectious. Foot and mouth is often not fatal to animals, but in the short term produces hideous blistering, and in the long term, impairs their use as productive livestock. The disease rarely produces severe illness in humans, although people can transmit it to animals. Specialists at the BioSecurity conference conjured scenarios in which other viruses and bacteria (including plague, anthrax, and tularemia) could be introduced into animal populations, with the ultimate goal of spreading illness to humans. That probably would prove not to be a particularly efficient mode of transmission but would spawn considerable fear. Early detection of a biological attack is paramount, specialists said. Note that Florida's Agriculture Secretary, Charles Bronson, said that in the aftermath of the Sept. 11, 2001 terrorist attacks, the state needs one person focused on assuring the safety of Florida's food supply. "Domestic security threats to our food supply, as well as the threat of introduction of animal diseases that could also affect humans, remain a critical focus both nationally and in Florida," Bronson said. "We must have increased ability to prepare, prevent and respond to any biological or chemical threat to our food supply and animal populations." Today's food is supplied to consumers through a complex web of computer-assisted endeavors. These involve food production, processing, transportation, storage, and marketing. The food-supply chain is only as strong as its weakest link. We need to try to determine the seriousness of what might happen if any of the above threats impact our food supply. Government programs impact food production activities in a major way, and government rules and regulations impact other sectors of the food-supply chain. But the U.S. Department of Agriculture (USDA) will be powerless to act in the event of a loss of computer networks (LOCN). Many experts feel that the transportation sector is the weakest link of the food-supply chain. The average food item travels 1300 miles to get to our table. There are many LOCN problems in transportation -- trucking, rail, aviation, and maritime. If there are disruptions in these systems due to LOCN, who wants to bet that a given locality will be impacted for no more than three days? My family had a Victory Garden during WWII. It was in a vacant lot next to our house in Chicago. Its produce supplemented transported food. If and when a LOCN hits, transported food will dwindle to a trickle. This will be due to fuel shortages, or to very slow trucks and trains whose computerized tracking or switching systems might be inoperative. Furthermore, how will truck drivers and train engineers get to work? Will there be fuel for their cars? For their highway trucks and train engines? Will they want to leave their families in a time of societal stress? It's important for a family to stockpile food now. Ours is perhaps the only time in history when people do not store food to get through the next winter and spring. Stockpiling food in advance of a crisis is a wise, unselfish, and honorable thing to do. Hoarding food after a crisis erupts is not. In times past, families would have a several-month's to a year's full pantry. That was before the invention of computerized, just-in-time delivery systems. Many of these food-delivery systems today are not immune to a LOCN. A year's supply of food for several people can save lives when one or more of the above-mentioned threats to our food supply hits. If you happen to store too much food, you get to eat your mistake. If you just sit tight, you're at least prepared for any kind of emergency. Your preparations are like an insurance policy, and the dividends are paid to you. If you are able to have a backyard vegetable garden, be sure to order non-hybrid seeds from Geri Guidetti's Ark Store, and be sure to read her Food Supply Updates. Seed storage needs to be done carefully. Leftover (or newly ordered) seeds will germinate MUCH better next year if you keep them COOL AND DRY now and throughout the coming winter. In fact, just a tiny 10-degree F drop in storage temperature can DOUBLE the life expectancy of those seeds. For REAL long-term storage, Mary Albrecht, PhD, research floriculturalist at Kansas State University, recommends refrigeration; she explains that dried and refrigerated seeds will last 10 TIMES as long as packaged seeds stored at room temperature. Here's Dr. Albrecht's advice. Store your seeds and silica in the refrigerator if you have room, or in a cool closet or basement. NEVER leave seed packets sitting around in the open! In just 1 HOUR on a humid day, unprotected seeds can absorb enough moisture to cut their storage life IN HALF. If properly stored, most vegetable seeds will provide you with good germination for up to five years or more. The big exception, it seems, is onion seed--it will germinate reliably well for only 2 years, even under the very best of storage conditions. As a minimum, consider storing a six-month supply of canned tuna or salmon, powdered milk, canned fruits and vegetables, and multivitamins to nourish each person for whom you are responsible. Add to these off-the-shelf supplies about 185 lbs of grain per person. Bread consisting of 40% wheat, 40% corn, and 20% soybeans is said to provide a complete protein and amino-acid balance, according to A. Robinson, head of the Oregon Institute of Science and Medicine. You'll have to work at acquiring a taste for this bread, however. Buy triple-cleaned wheat. Grit will damage your grain mill. A reliable source of clean, organically grown grain can be found at Pleasant Hill Grain. Use plastic, food-grade containers with sealing lids, and oxygen-absorber packets, to store your grains. One can buy filled buckets of grains or beans from AAOOB Storable Foods. Both AAOOB and Pleasant Hill also sell long-term survival packs that contain all kinds of familiar foods. For the Lord sendeth the rain and the sun on the just and the unjust alike. As the Master gave, being forewarned ye may be forearmed. For if an individual knew beforehand he would not allow his house to be broken up by those who act as thieves in the night to the individual's purpose or the individual's activity. Don't think that there will not be trouble, but those who put their trust wholly in the Lord will not come up missing but will find conditions, circumstances, activities, some way and somehow much to be thankful for. The 300-year-old experiment in fractional reserve banking will be over. Our addiction to bureaucracy will be over. Erosion of the historical soil of Western legal tradition may even be reversed, or a new form of the law will evolve -- one suitable to the New Age. Idries Shah, the Sufi teacher of the Age (died 1996), wrote, "Do you want to try to awaken to knowledge? Or do you want to just adopt an ideology and try to make the world and oneself fit in with its demands?" Thus, we are to differentiate between the crutch of ideology and the transformation of one's inner psychological landscape. Cayce reading 3976-18 says, "For as the time or the period draws near for these changes that come with the new order, it behooves all of those who have an ideal -- as individuals, as well as groups or societies or organizations, to be practicing, applying same in their experience -- and their relationships as one to another." Are the above statements merely two different approaches to the same thing? According to Webster's Collegiate Dictionary, ideology means "visionary theorizing, a systematic body of concepts (esp. about human life or culture), or a manner or the content of thinking characteristic of an individual, group, or culture....” An ideal, on the other hand, is "a standard of perfection, beauty, or excellence.... an ultimate object or aim or endeavor." According to an interpretation of the readings, "The true ideal is the highest spiritual attainment to be reached on this material plane; hence, it follows that our ideal must be found in Christ, who is the Way" (A Search For God, Book I). What is my ideal, one is encouraged to ask. Finally, we have the council given to Cayce and his group of friends following his dream of coming Earth changes, for which Cayce had asked an interpretation. That the periods from the material angle as visioned are to come to pass matters not to the soul, but do thy duty TODAY! TOMORROW will care for itself. These changes in the Earth will come to pass, for the timeand times and half times are at an end, and there begin those periods for the readjustments. For how hath He given? "The righteous shall inherit the Earth." Shah, I., 1980, The Way of the Sufi, Octagon Press, London, p. 52.